Appointed as president of the American Stock Exchange (Amex) in May 2000, Peter Quick is extremely active in the business and financial community. 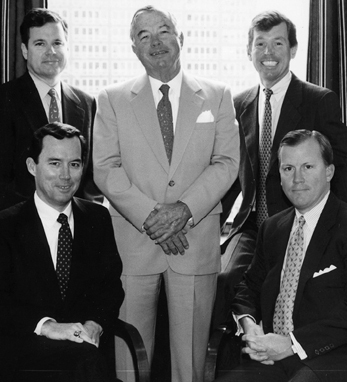 (Quick is pictured standing left with his late father, Leslie Quick, Jr., and three brothers. See list for profiles on Christopher Quick, Thomas Quick, and Leslie Quick III.) Quick serves on the American Stock Exchange Board of Governors, is an active member on the Board of Directors of the Securities Industry Automation Corporation, the Depository Trust & Clearing Corporation, and Reckson Associates Realty Corp., Long Island’s largest commercial landlord. Prior to joining Amex, he was president and CEO of Quick & Reilly Inc., a leading discount brokerage firm. Quick is dedicated to community organizations and he serves on the Board of Directors of St. Francis Hospital and Good Shepherd Hospice. After receiving his bachelor’s degree in engineering from the University of Virginia, Quick attended Stanford University’s Graduate School of Petroleum Engineering. He was a lieutenant in the U.S. Navy and served four years on active duty. He received the prestigious Ellis Island Medal of Honor award in May 2001.